Circuits of 20 days which will take you from north to south of Laos. Through these circuits, you can enjoy a different discovery of Laos, off the established trails. Cruising, hiking, visiting, meeting, explorating, during these 20 days, you will discover the Laos from north to south in various forms. 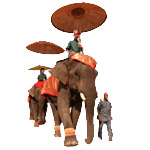 With this tour you will discover all the charms of Laos. From minorities in the North to the fishermen in the South, the monks of Luang Prabang and Vientiane architecture, we drive to the amazing caves Konglor.